There are very few Ironman distance races with as much history as Challenge Roth. It’s an iconic race, one that should be on every long distance triathletes check list. Roth offers a fast course, superb support and (alcohol free) beer at the finish line. What’s not to like? 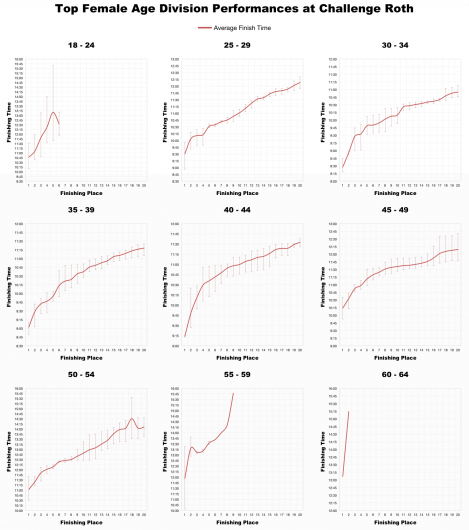 The website lists 25 years of results data, unfortunately time and accessibility has limited me to the last three for the purposes of this results analysis. 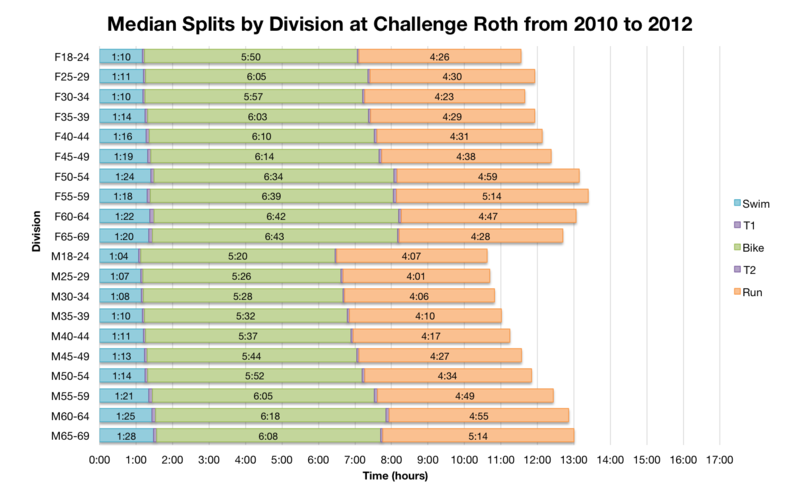 A fast course has a fast distribution of splits as Roth’s chart at the top shows – narrow and skewed towards the left. This is a quick course and while conditions have varied it is a good location for those looking for an Iron distance PB. 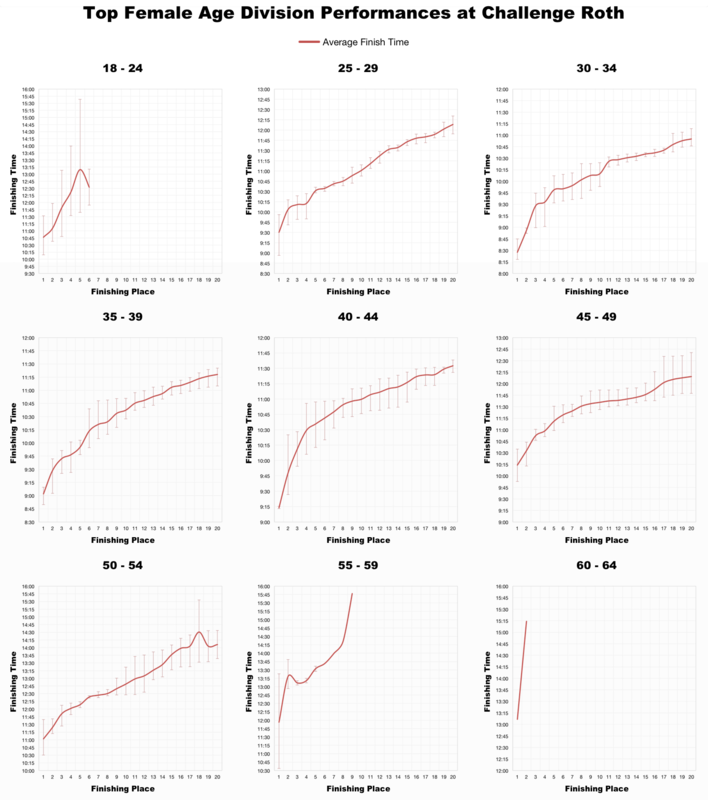 For comparison I’ve also included charts from two other fast European Ironmans: Frankfurt and Austria. Like it’s Ironman branded counterparts Roth attracts a strong field of athletes and provides the course for fast times. 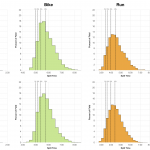 The distributions show broadly similar patterns; there are more similarities than differences between these three events. 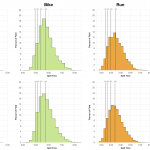 The swim is one area where these races distinguish themselves perhaps a result of the differing starts: Roth is a full wave start, Frankfurt has a smaller advanced wave before the bulk of the field and Austria is a standard Ironman mass start. Of course the median splits are quick too. Again if you compare back to Austria or Frankfurt you’ll find similar numbers. 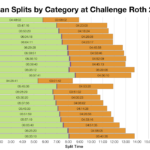 It is worth noting here that Challenge Roth does not have separate pro divisions – professional athletes are included in age divisions in the results. 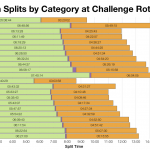 Using medians should help limit the impact of Andreas Raelert’s 7:41 record on the 35-39 age group splits though. I considered the removal of known pro triathletes from the data – Thorsten kindly provided a list of pros he’d identified – but as I started to update their details it became clear it wasn’t always 100% clear cut. There are athletes among the pro bib numbers not identified in Thorsten’s list, presumably local pros not seen on the Ironman circuit. Google searches for names identified self-branded semi-pros racing at the highest level and holding down a day job. I stopped before I began considering the idea of elite age groupers. Without a registered professional division any categorisation felt arbitrary so I decided to leave the results unchanged. 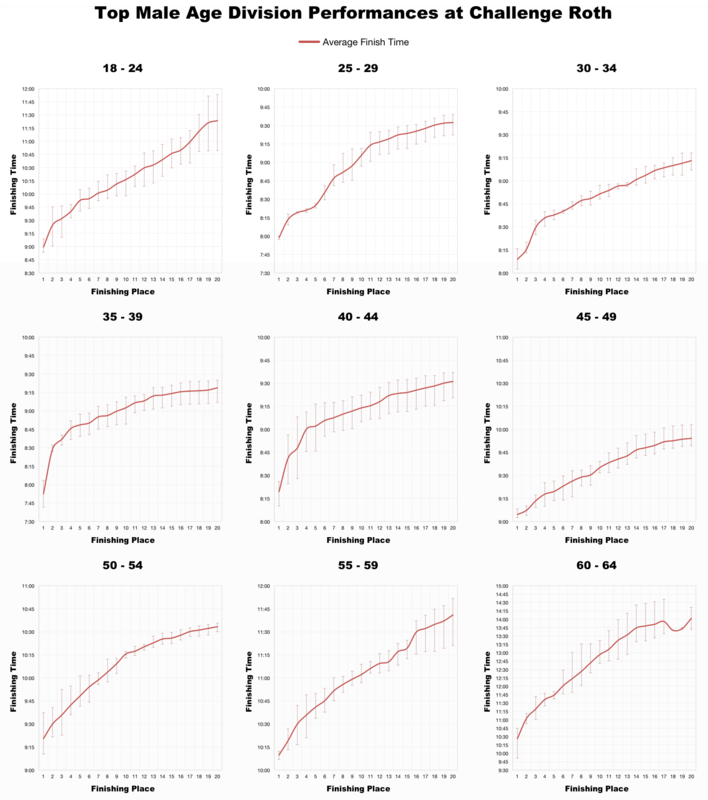 The biggest impact of this decision is on the top 20 age group performances where times at the very front become significantly faster than usual. If you are a 35-39 year old man you will be ranked against the likes of Andreas Raelert with many of the top placings potentially pro. 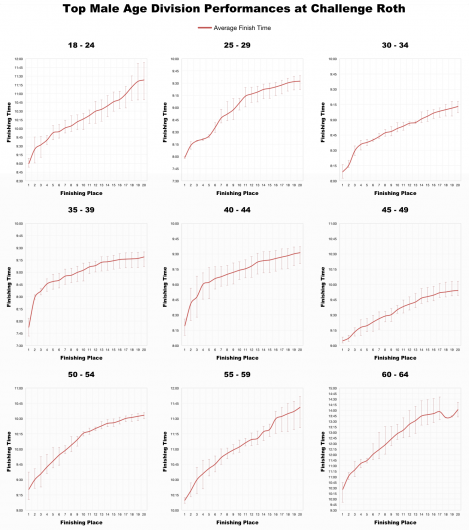 For men and women between 25 and 45 average times are lowered by the professional ranks. That’s how it works at Roth. Prizes are award for the top 3 in each age division with the overall top 10 men and women excluded. That still means a solid sub-9 performance in many male age groups (sub-10 for the women) to place on the age division podium. Roth is a fast course and it attracts a strong field, both professionals and age groupers (wherever the boundary lies) come to set rapid times. It, along with Frankfurt and Austria, is one of my recommendations for the those looking to break 10 hours at Ironman. Conditions this weekend look favourable – good news for the large group of athletes I have racing out there. I’m optimistic I’ll see a few PBs.